To always be yourself – but your best self. Not to compare yourself with anyone else – only with how you were yesterday. Self-knowledge is the start of self-improvement. Only you are responsible for your decisions and life. So don’t decide anything or do anything based on what others think. Offence is taken not given. 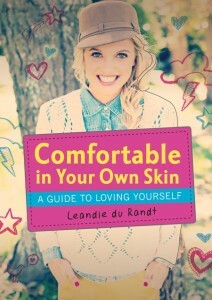 Comfortable In Your Own Skin is available in bookstores countrywide and costs R108 at Kalahari.com. For more info contact Leandie at durandtleandie@gmail.com or call 082-776-9158.